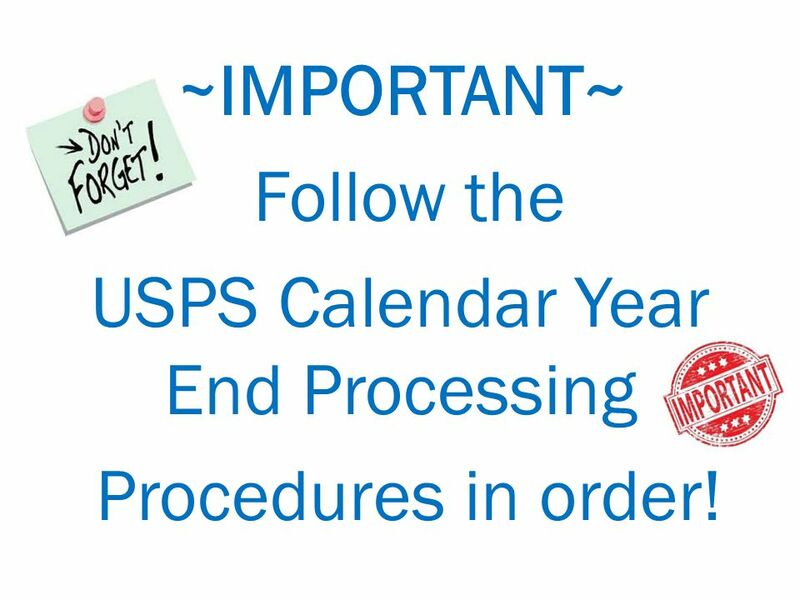 3 ~IMPORTANT~ Follow the USPS Calendar Year End Processing Procedures in order! 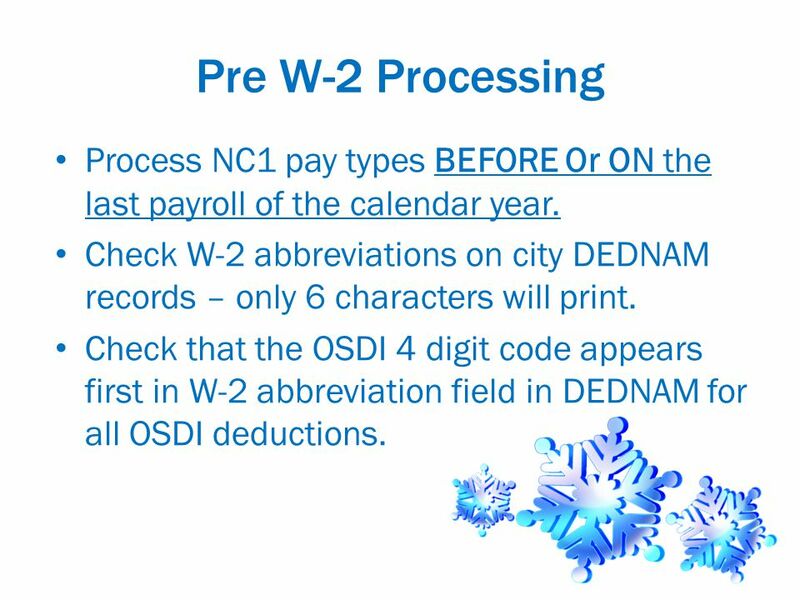 4 Pre W-2 Processing Process NC1 pay types BEFORE Or ON the last payroll of the calendar year. 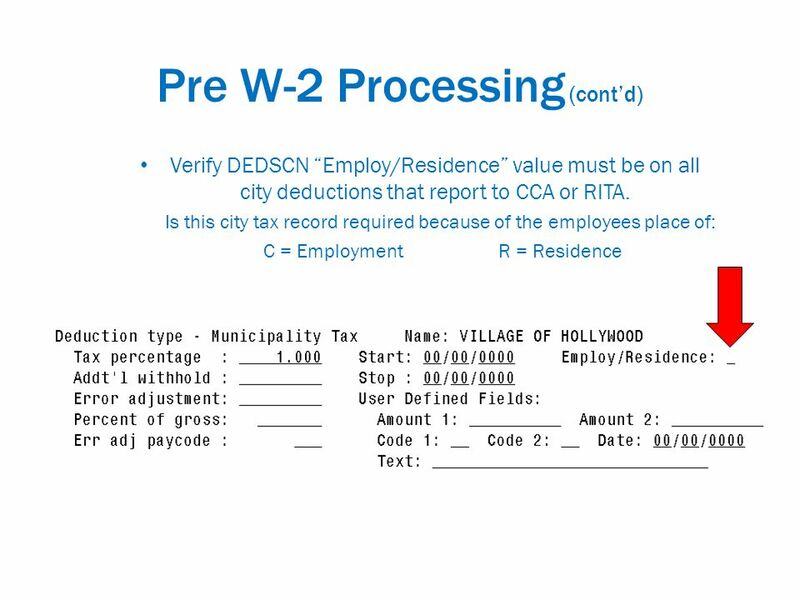 Check W-2 abbreviations on city DEDNAM records – only 6 characters will print. Check that the OSDI 4 digit code appears first in W-2 abbreviation field in DEDNAM for all OSDI deductions. 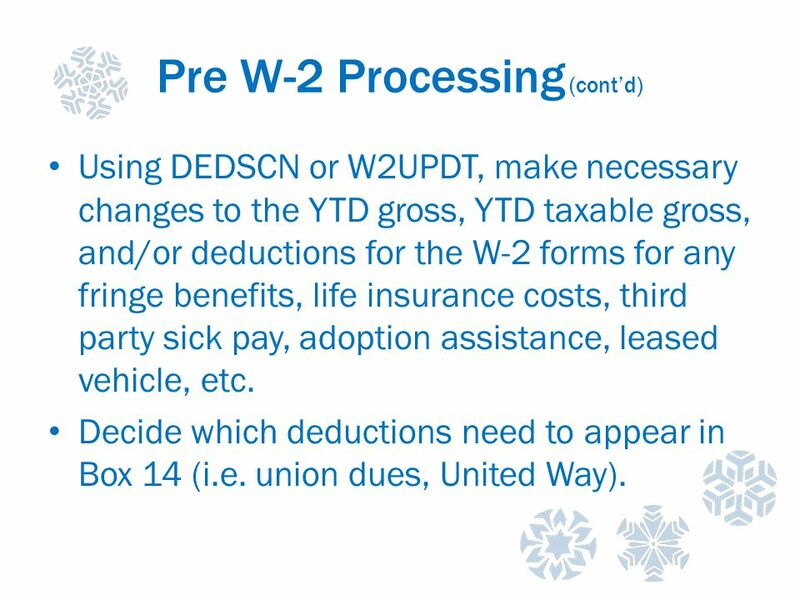 5 Pre W-2 Processing (cont’d) Using DEDSCN or W2UPDT, make necessary changes to the YTD gross, YTD taxable gross, and/or deductions for the W-2 forms for any fringe benefits, life insurance costs, third party sick pay, adoption assistance, leased vehicle, etc. Decide which deductions need to appear in Box 14 (i.e. union dues, United Way). 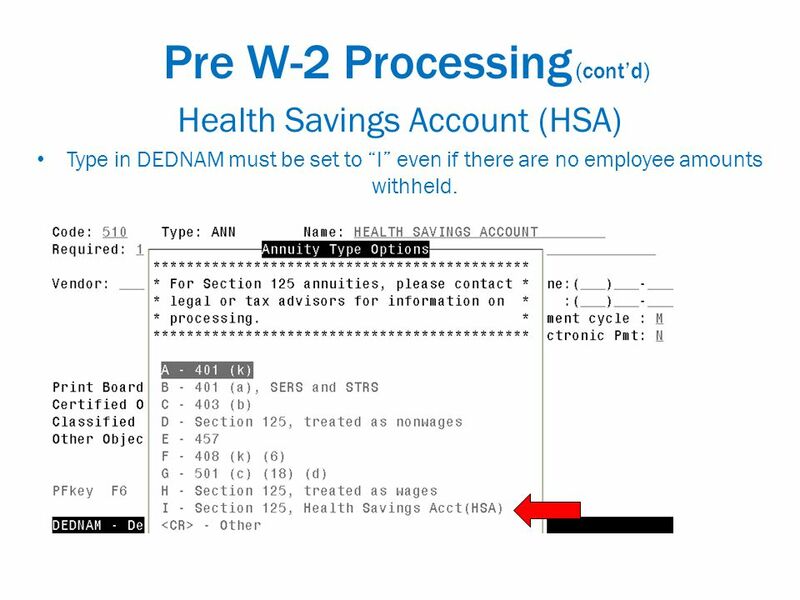 7 Pre W-2 Processing (cont’d) Health Savings Account (HSA) Type in DEDNAM must be set to “I” even if there are no employee amounts withheld. 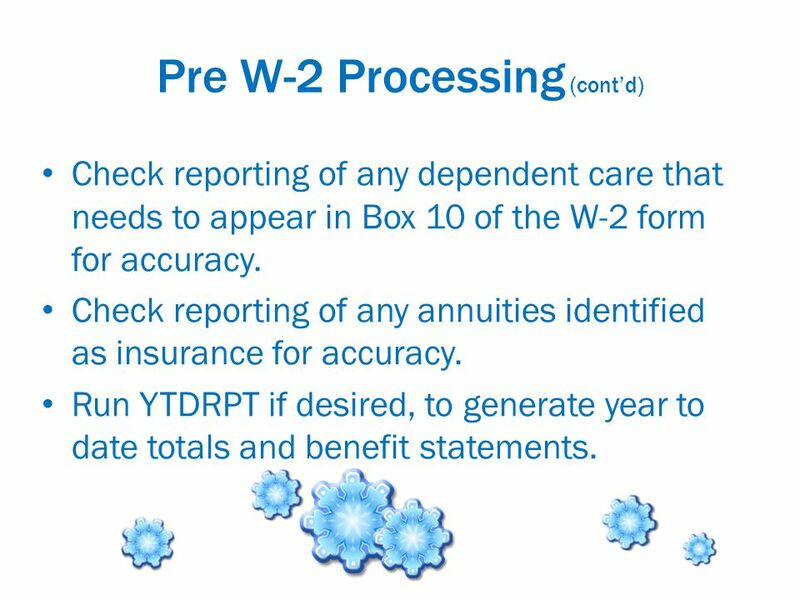 8 Pre W-2 Processing (cont’d) Check reporting of any dependent care that needs to appear in Box 10 of the W-2 form for accuracy. Check reporting of any annuities identified as insurance for accuracy. Run YTDRPT if desired, to generate year to date totals and benefit statements. 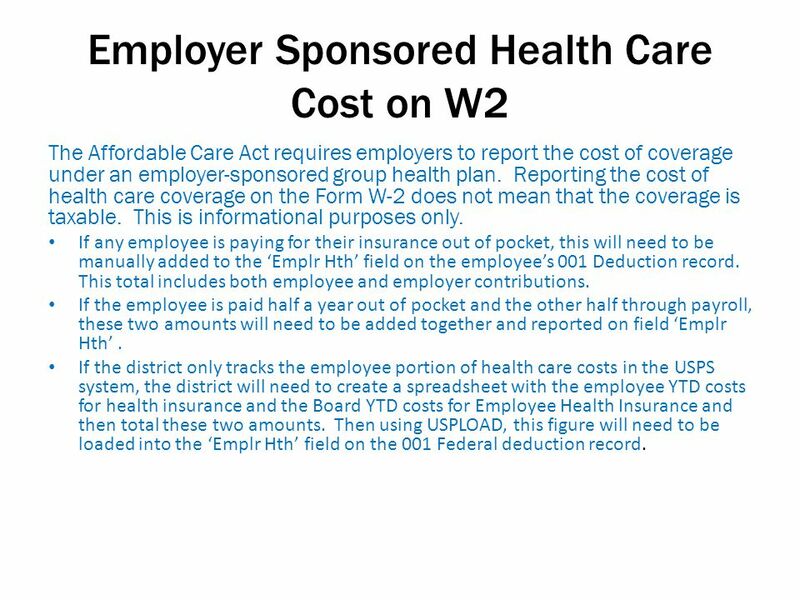 9 Employer Sponsored Health Care Cost on W2 The Affordable Care Act requires employers to report the cost of coverage under an employer-sponsored group health plan. Reporting the cost of health care coverage on the Form W-2 does not mean that the coverage is taxable. This is informational purposes only. 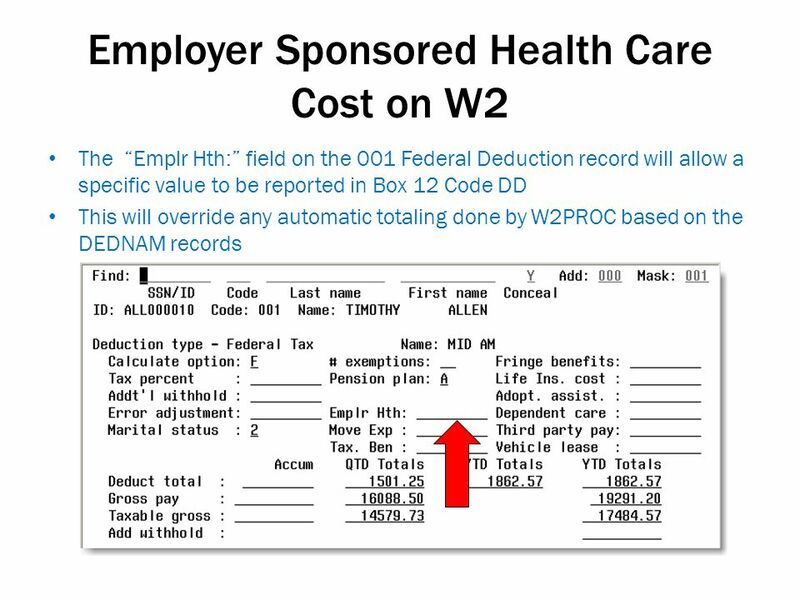 If any employee is paying for their insurance out of pocket, this will need to be manually added to the ‘Emplr Hth’ field on the employee’s 001 Deduction record. This total includes both employee and employer contributions. If the employee is paid half a year out of pocket and the other half through payroll, these two amounts will need to be added together and reported on field ‘Emplr Hth’. 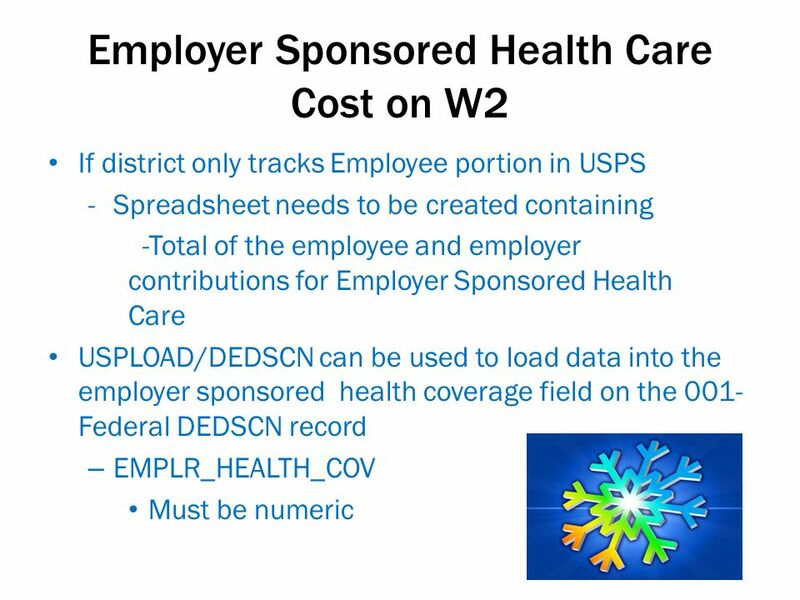 If the district only tracks the employee portion of health care costs in the USPS system, the district will need to create a spreadsheet with the employee YTD costs for health insurance and the Board YTD costs for Employee Health Insurance and then total these two amounts. Then using USPLOAD, this figure will need to be loaded into the ‘Emplr Hth’ field on the 001 Federal deduction record. 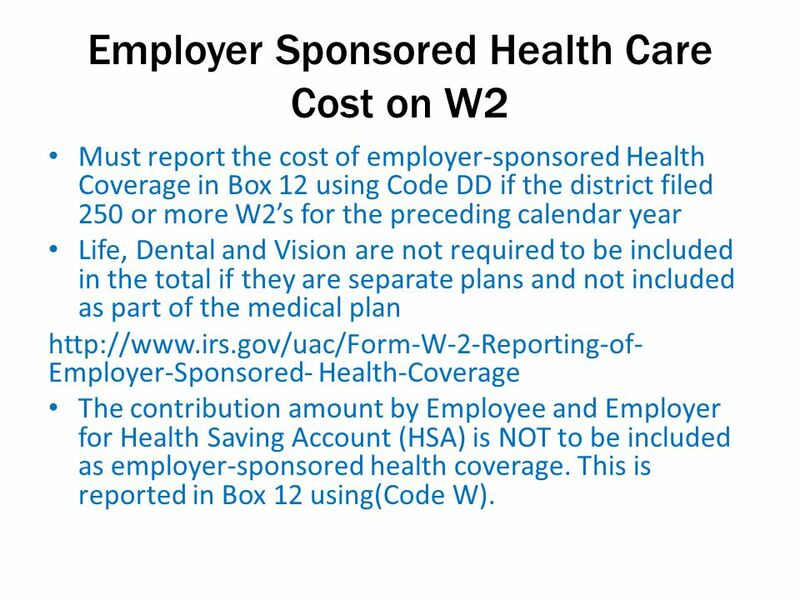 10 Employer Sponsored Health Care Cost on W2 Must report the cost of employer-sponsored Health Coverage in Box 12 using Code DD if the district filed 250 or more W2’s for the preceding calendar year Life, Dental and Vision are not required to be included in the total if they are separate plans and not included as part of the medical plan http://www.irs.gov/uac/Form-W-2-Reporting-of- Employer-Sponsored- Health-Coverage The contribution amount by Employee and Employer for Health Saving Account (HSA) is NOT to be included as employer-sponsored health coverage. This is reported in Box 12 using(Code W). 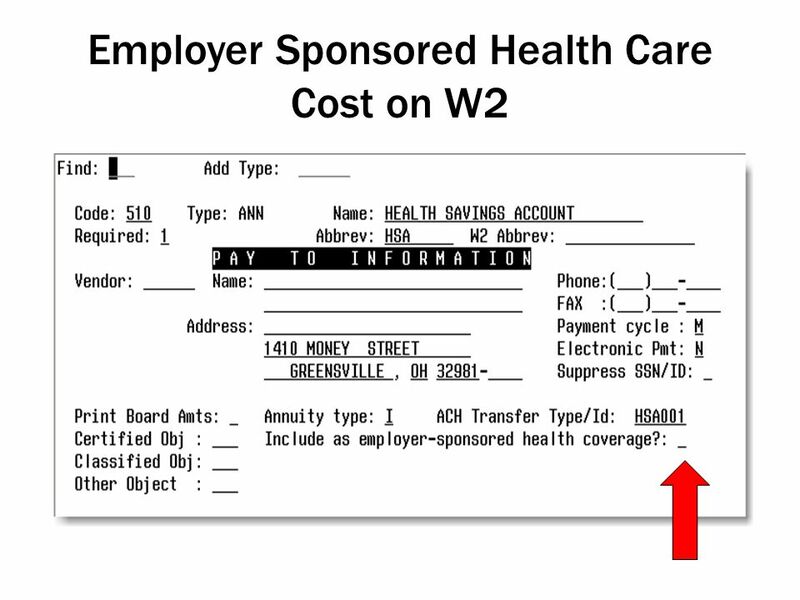 11 Employer Sponsored Health Care Cost on W2 The flag “Include as employer-sponsored health coverage? 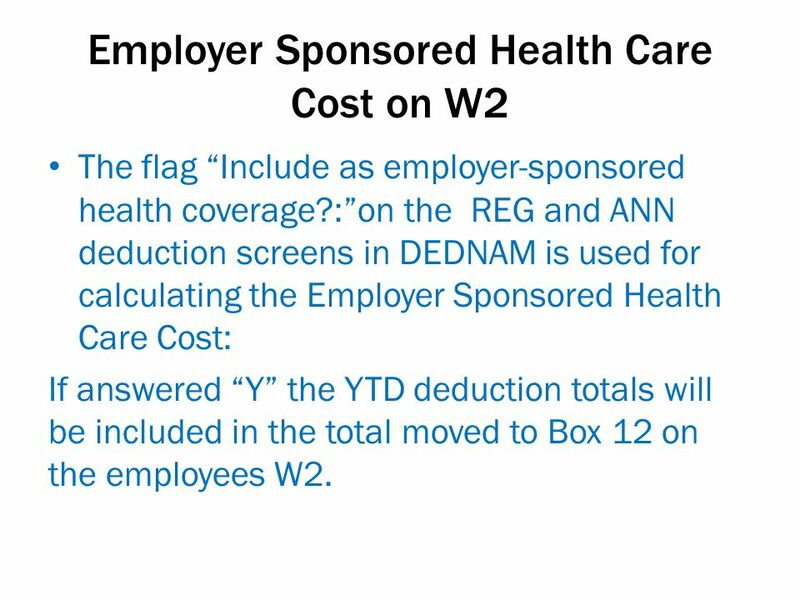 :”on the REG and ANN deduction screens in DEDNAM is used for calculating the Employer Sponsored Health Care Cost: If answered “Y” the YTD deduction totals will be included in the total moved to Box 12 on the employees W2. 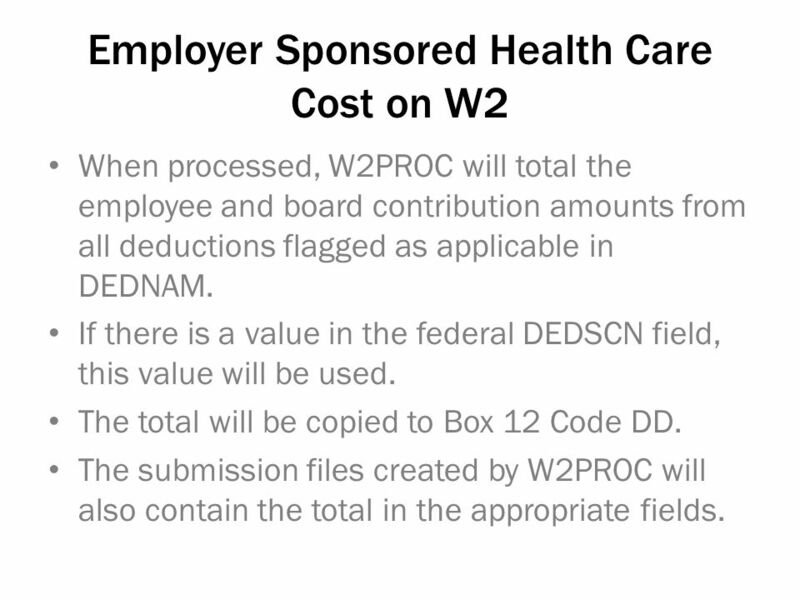 14 Employer Sponsored Health Care Cost on W2 When processed, W2PROC will total the employee and board contribution amounts from all deductions flagged as applicable in DEDNAM. If there is a value in the federal DEDSCN field, this value will be used. The total will be copied to Box 12 Code DD. The submission files created by W2PROC will also contain the total in the appropriate fields. 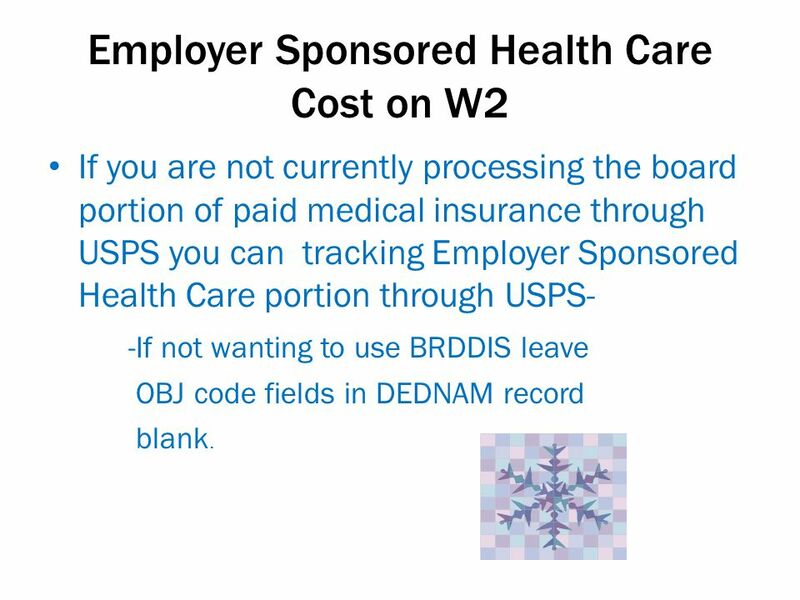 16 Employer Sponsored Health Care Cost on W2 If you are not currently processing the board portion of paid medical insurance through USPS you can tracking Employer Sponsored Health Care portion through USPS- -If not wanting to use BRDDIS leave OBJ code fields in DEDNAM record blank. 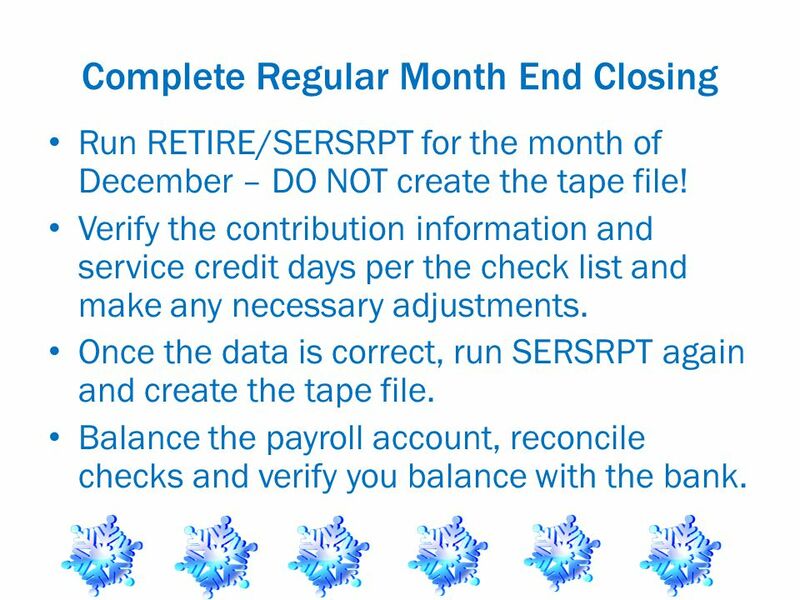 17 Complete Regular Month End Closing Run RETIRE/SERSRPT for the month of December – DO NOT create the tape file! Verify the contribution information and service credit days per the check list and make any necessary adjustments. Once the data is correct, run SERSRPT again and create the tape file. Balance the payroll account, reconcile checks and verify you balance with the bank. 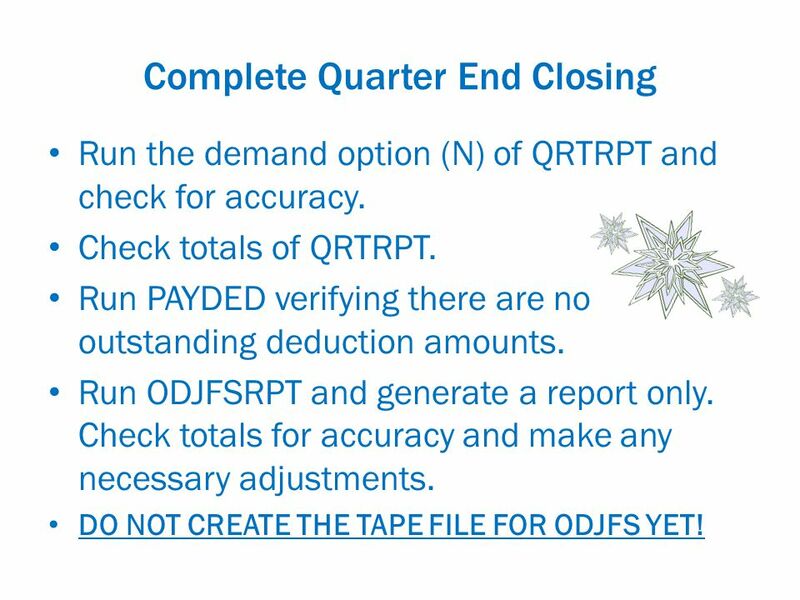 18 Complete Quarter End Closing Run the demand option (N) of QRTRPT and check for accuracy. Check totals of QRTRPT. Run PAYDED verifying there are no outstanding deduction amounts. Run ODJFSRPT and generate a report only. Check totals for accuracy and make any necessary adjustments. DO NOT CREATE THE TAPE FILE FOR ODJFS YET! 19 Complete Quarter End Closing (cont’d) Once ODJFSRPT is correct, run reports. Run W2PROC with correct ‘type of employer’ field and in the order you desire them to be printed. 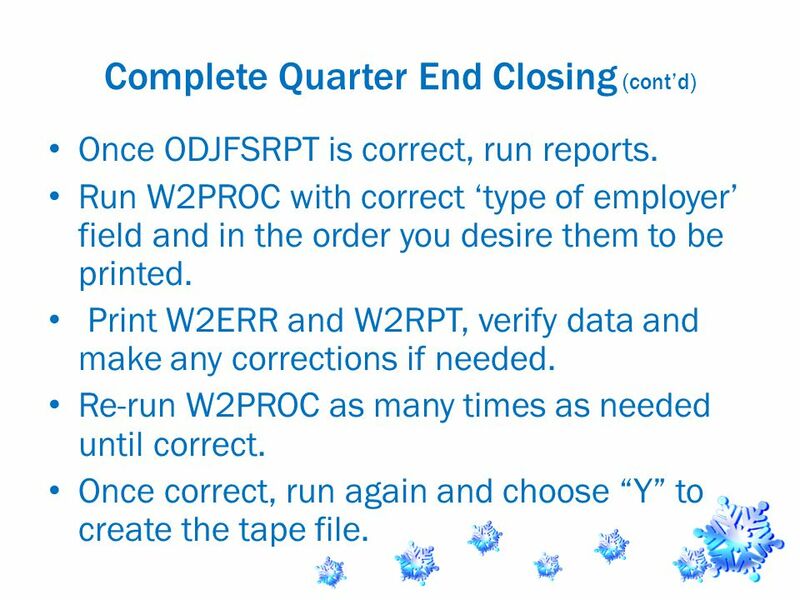 Print W2ERR and W2RPT, verify data and make any corrections if needed. Re-run W2PROC as many times as needed until correct. Once correct, run again and choose “Y” to create the tape file. 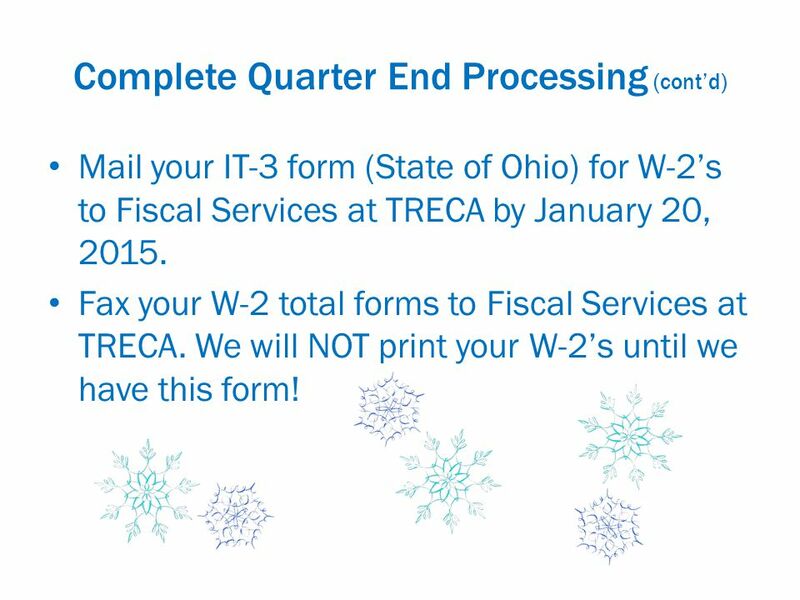 20 Complete Quarter End Processing (cont’d) Mail your IT-3 form (State of Ohio) for W-2’s to Fiscal Services at TRECA by January 20, 2015. 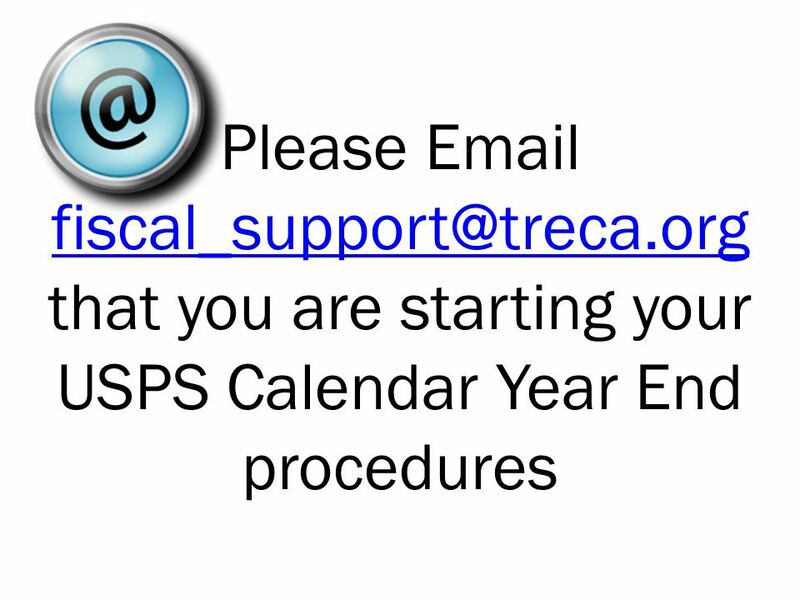 Fax your W-2 total forms to Fiscal Services at TRECA. We will NOT print your W-2’s until we have this form! 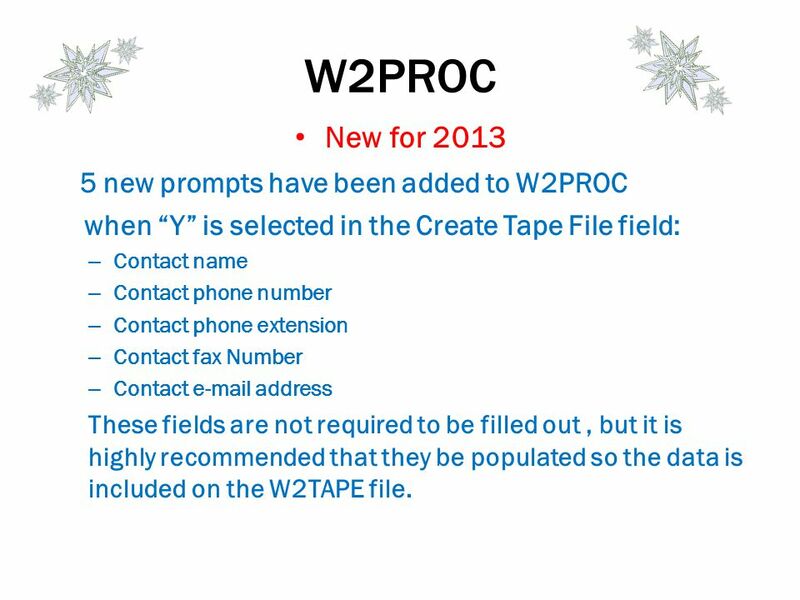 21 W2PROC New for 2013 5 new prompts have been added to W2PROC when “Y” is selected in the Create Tape File field: – Contact name – Contact phone number – Contact phone extension – Contact fax Number – Contact e-mail address These fields are not required to be filled out, but it is highly recommended that they be populated so the data is included on the W2TAPE file. 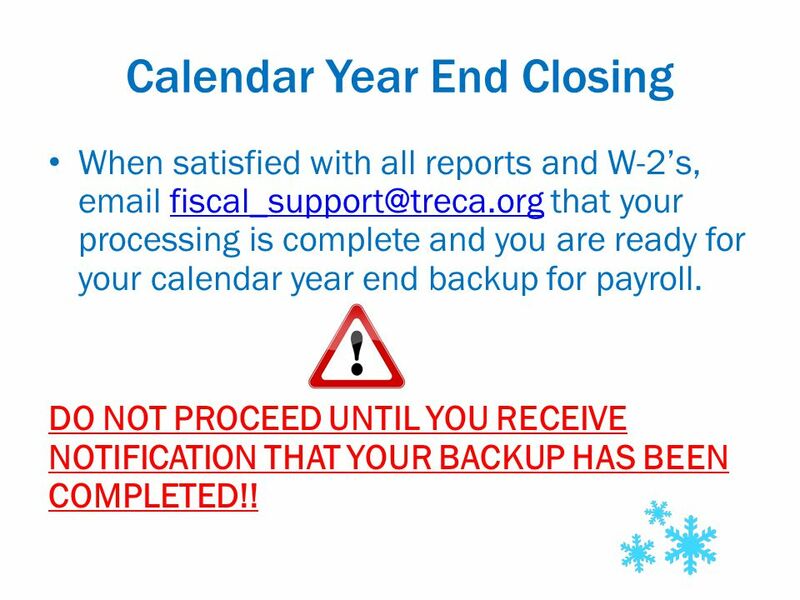 22 Calendar Year End Closing When satisfied with all reports and W-2’s, email fiscal_support@treca.org that your processing is complete and you are ready for your calendar year end backup for payroll.fiscal_support@treca.org DO NOT PROCEED UNTIL YOU RECEIVE NOTIFICATION THAT YOUR BACKUP HAS BEEN COMPLETED!! 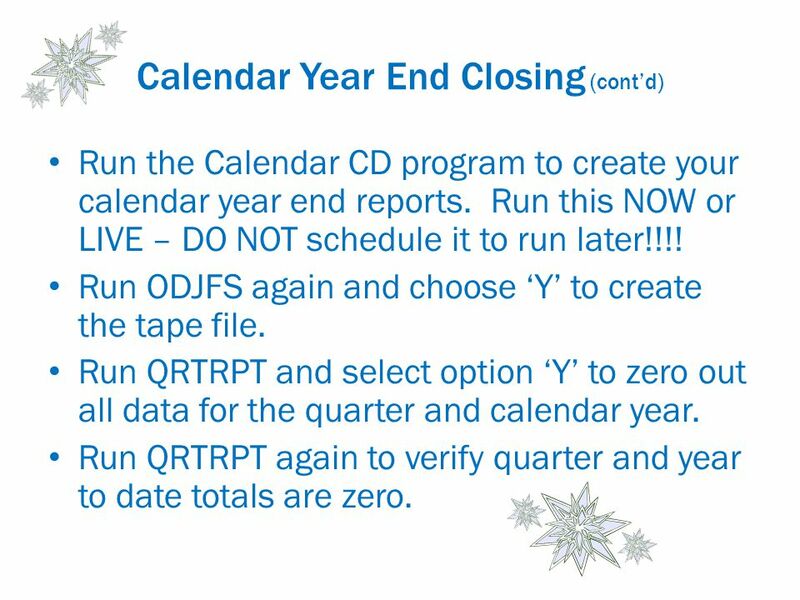 23 Calendar Year End Closing (cont’d) Run the Calendar CD program to create your calendar year end reports. Run this NOW or LIVE – DO NOT schedule it to run later!!!! Run ODJFS again and choose ‘Y’ to create the tape file. Run QRTRPT and select option ‘Y’ to zero out all data for the quarter and calendar year. Run QRTRPT again to verify quarter and year to date totals are zero. 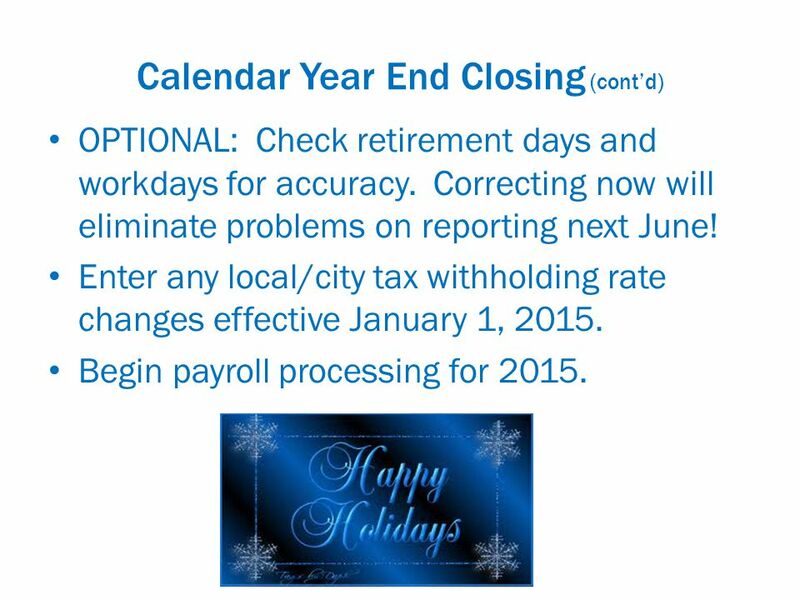 24 Calendar Year End Closing (cont’d) OPTIONAL: Check retirement days and workdays for accuracy. Correcting now will eliminate problems on reporting next June! Enter any local/city tax withholding rate changes effective January 1, 2015. Begin payroll processing for 2015. 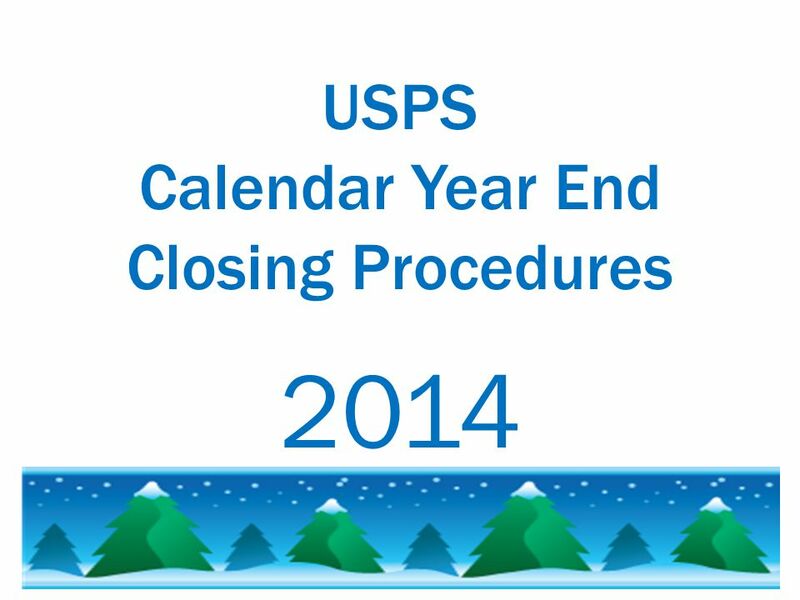 Download ppt "USPS Calendar Year End Closing Procedures 2014. Please that you are starting your USPS Calendar Year End procedures"
2007 WVEIS Data Conference Canaan Valley State Park Kim Harvey WVEIS Consultant. 2009 WVEIS Data Conference Canaan Valley State Park How to Read Your Paycheck Kim Harvey WVEIS Consultant. 1 USPS Calendar Year-end Review Calendar Year 2013. Preparing for Year End in Payroll Mindy Harada 1. June Disclaimer 2 This document is to be used as supplemental information only. This document is not a complete Fiscal Year End Checklist and should. 1 USPS Calendar Year-end Review Calendar Year 2014. 2008. Pre-Closing NC1 Payments Verification USPCON STRS advance amount is zero from previous fiscal year Run STRSAD Create new job calendars EMIS staff. DMVA Monthly Time Sheets Hit “Enter” or click your mouse to advance to the next screen. USPS Roundtable ACCESS February 25, Calendar Year End Recap All District Files Were Submitted on 2/16  W2’s Social Security confirmed Completion. Flexgen Payroll Deduction Maintenance. Highlights Set up Payroll Deduction Controls Employer Sponsored Health Care Reporting Employer Matching and the. Employee Self Service October 15, 2012. USPS Updates March 2007 Release. 2 General Updated tax related tables –Federal withholding tables –Federal withholding allowance amounts –EIC Payment. Payroll - W-2 Processing 1Freedom Systems – Payroll – W-2 Processing FREEDOM SYSTEMS PAYROLL – W-2 PROCESSING WEBINAR POWERPOINT PRESENTATION YOU MAY DOWNLOAD. Employee Online Tutorial. Employee ID Employee Id is the 3 or 4 digit # Assigned by Payroll, Employee Id must be preceded by 5 or 4 Zeros to be a total. Payroll Setup Chapter 6. PAGE REF #CHAPTER 6: Payroll Setup SLIDE # 2 2 Objectives Activate the payroll feature and configure payroll preferences Set.